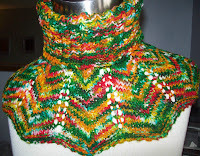 Cowl—complete.. Knit and Finished and blocked! 6 inches of Chevrons, and 6 more inches of ribbing—It's a lot of cowl—and I still have a good bit of yarn left to knit the cuffs of some fingerless glove. I'll pair with a solid colored yarn to extend the length of the gloves—there isn't enough for a decent pair—but just enough to make a cuff. I like that the cowl can be worn so many ways—folded so no ribbing shows, or folded so it does, or worn up side down on really awful days and offer protection to my face, too. I think the matching fingerless gloves are going to be a fancy chevron cuff in this same yarn, and then have a “hand” done in ribbing—snug ribbing, not the soft loose ribbing in the cowl. The will have a simple buttonhole for a thumb opening. Then the ribbed 'hand' can be worn on the hand (and the chevrons can be a sort of cuff) or the ribbed hand can be worn as a sleeve, and the cuff can escape from the sleeve --over a pair of real gloves. Oh, Dang! I forgot-knitting real gloves is one of those thing that is supposed to be on my to do list! Well not now, not next. So what will be Next!? —Well, there's the question! 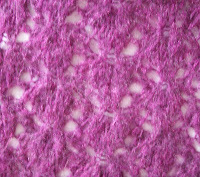 Maybe a small lace scarf--I've knit 10 in the past year (well since mid April of 2010) and given away 3. ( 1 is prototype—and not really exactly what I wanted—so at some time, it's back to the drawing board—or needles!) The others, have been worn once or twice each once—but you can always use another scarf, right? So what pattern? 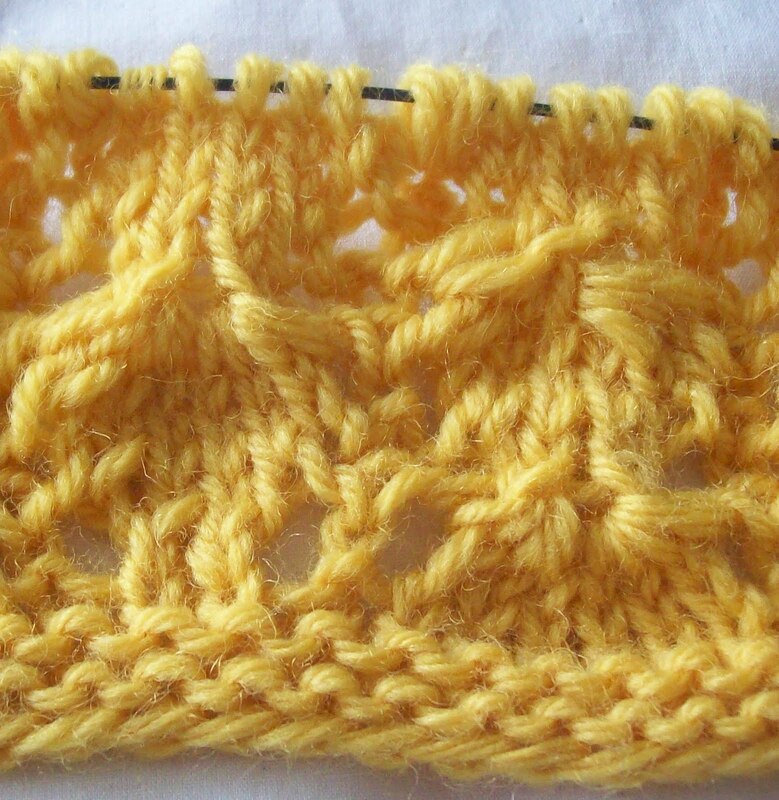 Maybe this stitch pattern—but better-- A nicer edging (lower/cast on edge) and a side edge, too. 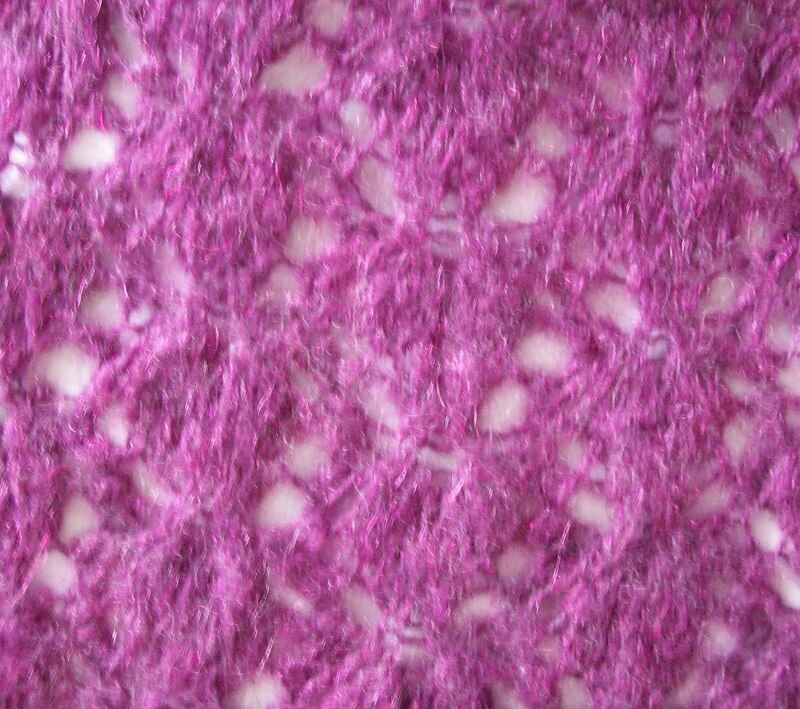 It's hard to see the details in this fuzzy mohair blend yarn—I need a smooth yarn. And I think I want some space between the motifs--(shells? berries? Leaves? ) 2 stitches? 3? Some lacy faggotting? 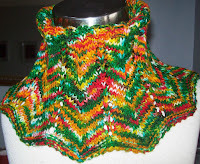 Or a solid stripe of stocking knit? So a swatch—in this yellow—which makes them look more like shells. 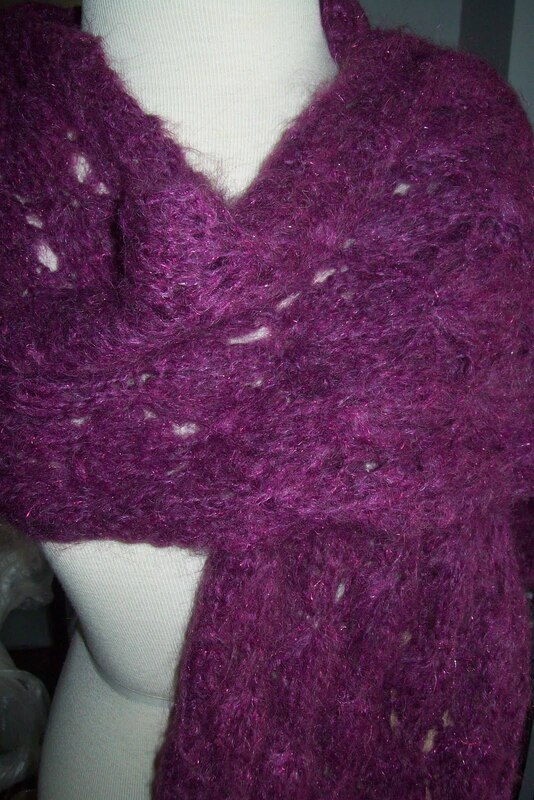 But I was thinking of using some wine red yarn—will they then look more like berries? I've changed the pattern round a bit in this swatch—but I need to do another-- I think a more open design—some lacy faggoting lines between the motifs to open the lace up more. The added space would be definite improvement. Unfamiliar with the lace pattern? Of course! It's one of my own creations! 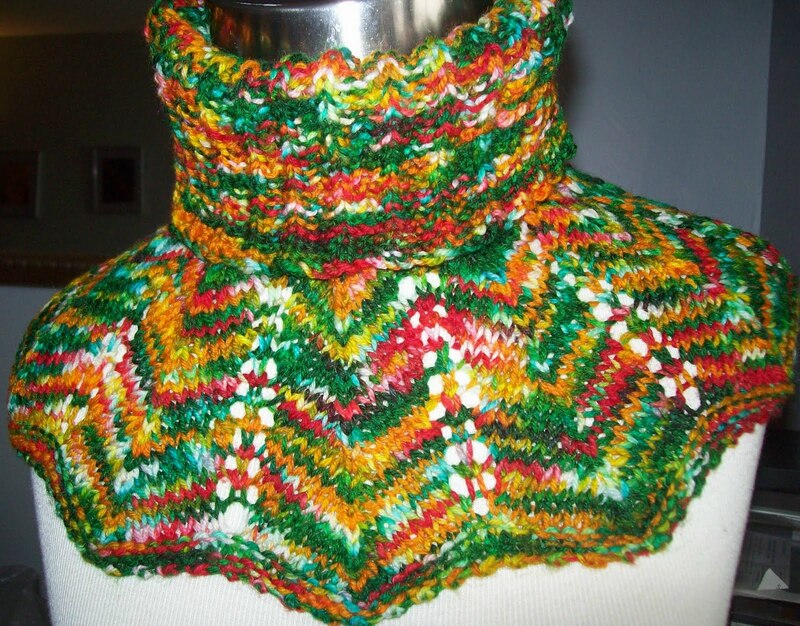 (It was an easy search—this pattern uses K4tog's—and not many patterns do) But I don't might these togethers—so its fine by me! Finally--the sock—still not ready for a heel flap. The cuff and leg are 6.5 inches, the flap will add another inch and a half (and then some) so I still need another inch before I start it. I'll take some more photo's once I've turned the heel. What will be next--isn't that ALWAYS the question? If I get a vote, I vote for strawberries, mostly because I love red.